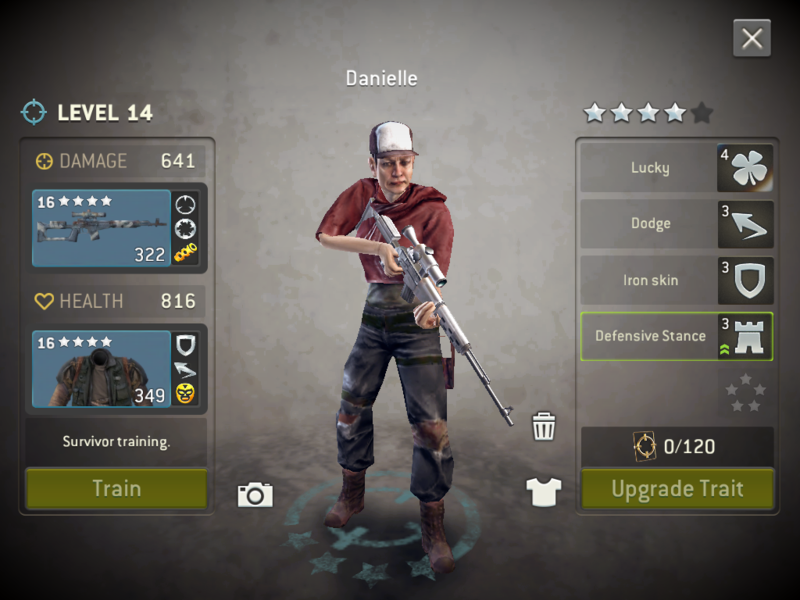 @toby2b2 , please post screenshots of your survivors, most likely it's due to the weapon traits. Also what level were the walkers? If the level difference between your survivor and the walkers are about 3 levels, it results in more body shots which could lead to taking more shots. Not likely due to the weapon traits, since this hunter legendary survivor was able to kill every zombie with only one shot before the survivor trait upgrade, using the same weapon as before. The zombies are all level 15, the same level as the legendary hunter survivor. I took screenshots of the two hunters for you to view. The only other Thing I can think of would be body shots, the next time it happens look at the text that pops up in game to see if you see body shots which deals 50% damage. 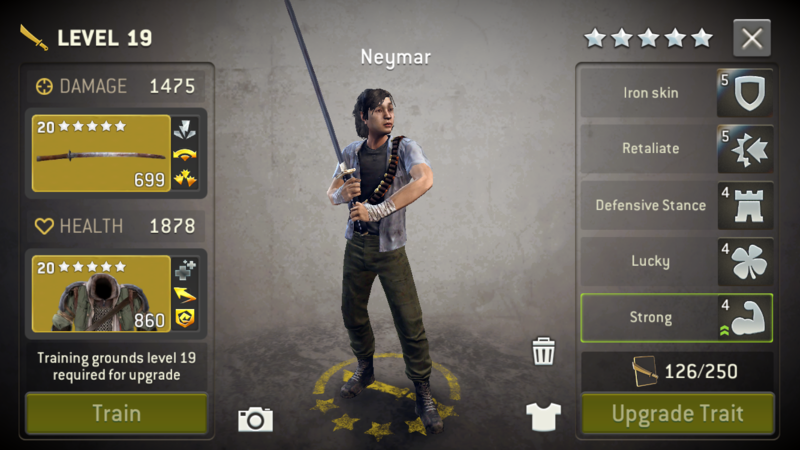 Obviously I am getting all body shots now with this level 15 legendary hunter survivor, since he can no longer kill any zombies of his same level with less than 2 shots. But that does not explain why this happened after upgrading one of his traits. He was able to kill these zombies with only 1 shot every time before this trait upgrade. And it also does not explain why the level 14 epic hunter survivor is able to kill these same zombies with only 1 shot every time, with much lower stats than the legendary higher level hunter. 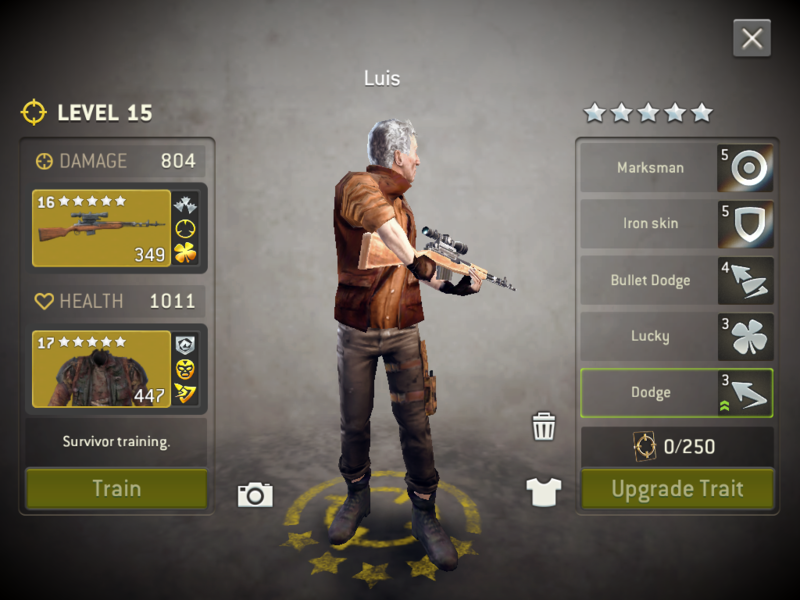 Level 14 4 star Danielle now makes level 15 5 star Luis look like a sissy during battle. A game flaw would be the only answer. Very disappointing when your best survivor becomes handicapped due to a trait upgrade. The upgrade is suppose to improve the survivor, not handicap him. Hello! I have a 19 level 5 stars warrior ready to be upgraded. Once i got the tokens to do it, when i press "upgrade trait" looked like it upgraded. But, in reality, it was downgraded. I should be in "defensive stand" instead of the actual "strong"
How can i/you fix it!